The Australian Square Kilometre Array Pathfinder (ASKAP) is CSIRO’s innovative radio telescope, located at the Murchison Radio-astronomy Observatory (MRO) in Western Australia, about 350 kilometres (km) northeast of the coastal town of Geraldton and about 750 km northeast of Perth. When fully commissioned, ASKAP will be the world’s largest, most sensitive survey radio telescope. It is made up of 36 steerable 12-metre antennas, working together as single instrument, spread out in a configuration to maximise science capability. The aim is for each antenna to be equipped with an innovative Phased Array Feed (PAF) receiver. PAFs are multi-pixel imaging devices that work like a digital camera, only in radio waves. PAFs allow huge areas of the sky (30 square degrees) to be covered at once – many times more area than is possible with traditional receivers. The antennas are connected via fibre optic cables to a control building where the data are digitised and filtered. Each antenna generates 30 beams (or views on the sky) which are analysed on site before being sent 800 km over fibre to the supercomputer at iVEC’s Pawsey Centre in Perth for processing. As the number of PAFs installed on ASKAP antennas increases, the scientific capability of the telescope is boosted substantially – six PAFs are already on the telescope and 12 more are on the way. With additional funding from SIEF (matched by CSIRO), the Project aims to enhance and extend ASKAP through the addition of another twelve PAFs and their associated digital systems, thus helping to ensure delivery of this revolutionary telescope at close to the scientific capability required to ensure optimum scientific impact and lasting benefit to Australia. 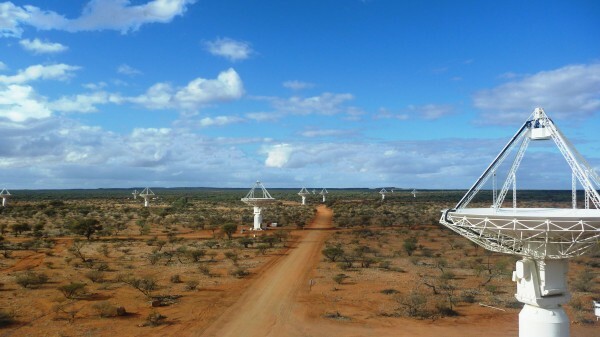 As well as being a world-leading telescope in its own right, ASKAP is also a precursor to the international Square Kilometre Array (SKA) radio telescope, to be hosted in Australia and southern Africa. As part of SKA Phase One (SKA1), the 36 existing ASKAP antennas will be expanded out to 96 dishes, forming SKA1-Survey. Equipped with PAF technology, this element of the SKA will be able to survey large areas of the sky in great detail. This program has been completed in 2016.